British tattoo artist Poppy Segger, 22, specialises in helping people get the perfect inking as a way of making something positive out of a difficult life experience, after going through her own mental health battles. She appears in the BBC Three documentary A Tattoo to Change My Life where she helps four women create a design that represents a significant and challenging period in their lives. Featured in the series are Tulsa Vagjiani, who lost her family in a plane crash 28 years ago as they flew to the UK from India. 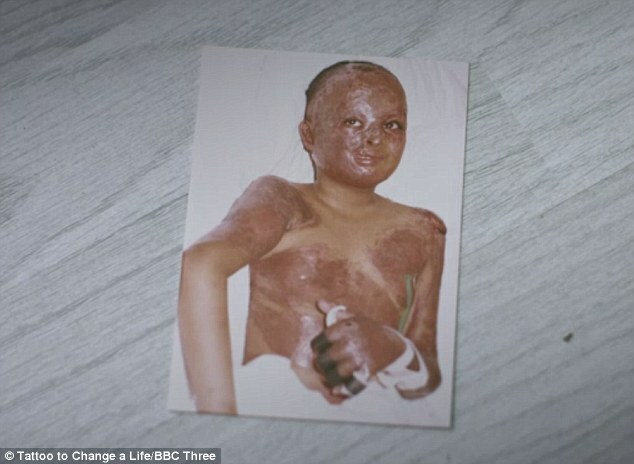 She was pulled from the wreckage but was left with severe scars all over her body. 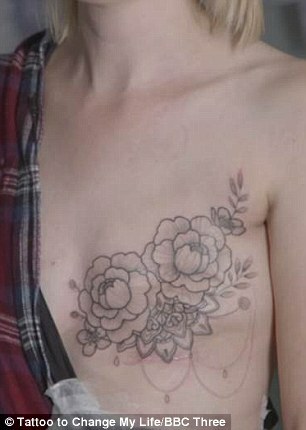 Mother-of-two Maia is a breast cancer survivor who chooses to cover her mastectomy scar with a tattoo to ‘feel pretty’ again. Also featured is 18-year-old Viktoria, who wants to cover up her self-harming scars; Jen who gets a tattoo to cover up the stretch marks from her weight loss. Poppy estimates that up to 70 per cent of her work involves covering up people’s scars. 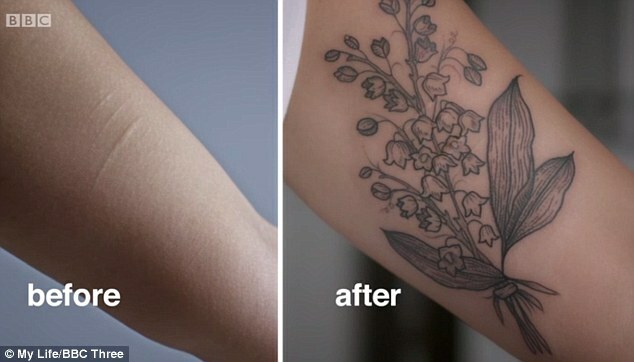 ‘People often underestimate the impact a tattoo can have on someone’s life,’ she explained. ‘To them it is just a tattoo, but they don’t understand the personal battle that happens to just get through it, get the tattoo and close that chapter. 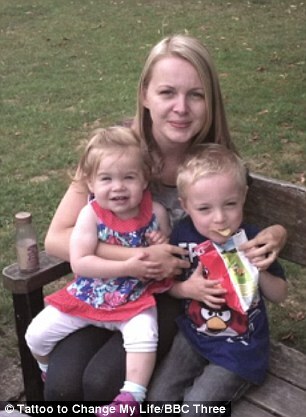 ‘It’s nice to know that because of something I can do will help make someone else a little bit stronger,’ she added. 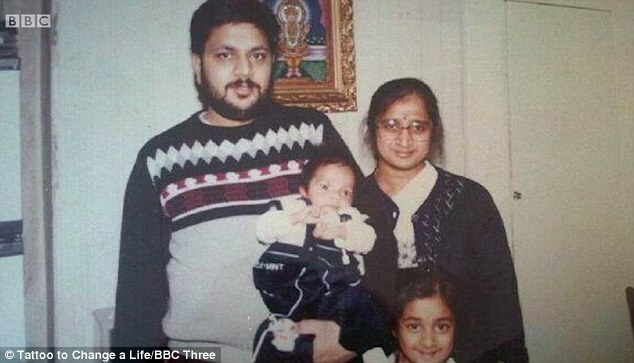 Tulsi Vagjiani, 38, was the only surviving member of her family after a 1990 plane crash that killed her parents, Dhanji and Premila, and brother Kamlesh. The motivational speaker, from London was on her first holiday to India aged 10, when the plane she and her family were travelling on crashed on landing in Bangalore and burst into flames. She was saved from the wreckage by a fellow passenger but was left with horrific burns and decided to get a tattoo in honour of their memory. ‘The only memory I have of the day of the crash, is me fighting with my younger brother because I wanted to sit by the window, and I remember he always got his way with things like that,’ she recalled. 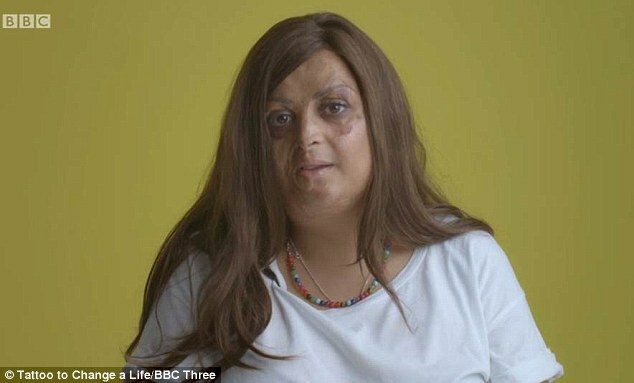 She struggled to deal with how she looked following the crash and endured more than 50 operations to rebuild her face, arms and legs. 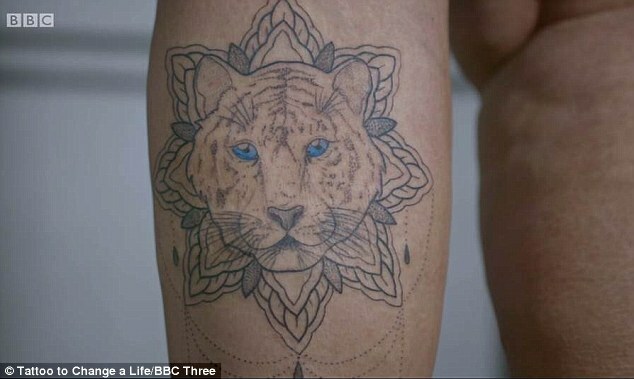 Because the scarring all over her body leaves her skin extremely thin and sensitive, Poppy advises against Tulsi getting a tattoo over a scar on her arm, instead inking a tiger design on the part of her leg that isn’t scarred. Maia had a mastectomy operation three and a half years ago and was left with two scars that she sees as a permanent and ‘constant reminder’ of her battle with cancer. The mother-of-two wants a tattoo to feel pretty again and visits tattoo artist Poppy: ‘It’s a step out of my comfort zone and something that I never thought I would do. Maia explains that the only people who have seen her scars are her doctors and consultants and her husband. ‘I never thought I would get cancer. In my mind I thought I was young, I was healthy and I had a good lifestyle. ‘When I was diagnosed I was scared, I didn’t really understand what was going to happen and what the future held. 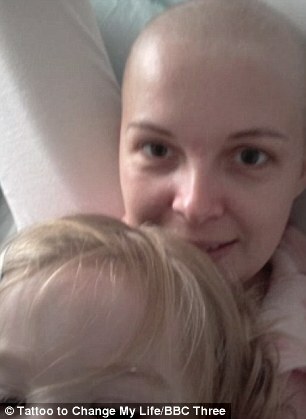 I thought I was going to die, I didn’t really understand cancer, it was extremely scary. Maia initially had an implant to replace her breast, but she said it didn’t feel natural and so made the decision to have it taken out. She explained how her cancer journey was mentally difficult with multiple hospital appointments, radiotherapy and her mastectomy operations. ‘It was hard. Afterwards you are just dropped off and expected to get on with life. It’s hard you forget what life was like before,’ Maia said of being given the all-clear. ‘This tattoo is definitely a way of me taking ownership of what is happening to my body, not for cancer to decide. 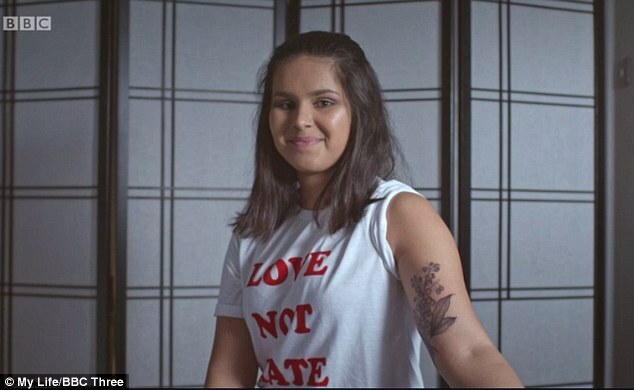 The 18-year-old from London, wants to cover up some of her self-harming scars that are on her left arm. She also has scars on her upper legs and torso. ‘I was always a very shy child. At the age of ten was when I started to not feel happy. I was very down all the time. ‘I came home from school one day and I was so stressed out. I had all these emotions built up inside of me and I needed a release. Viktoria explains her decision behind a lily of the valley design because it is a symbol of her birth month of May and the ‘coming of happiness’. ‘It’s a reminder that I was born for a reason, and I’m still here for a reason. And it symbolises the turning of a new page,’ she said. 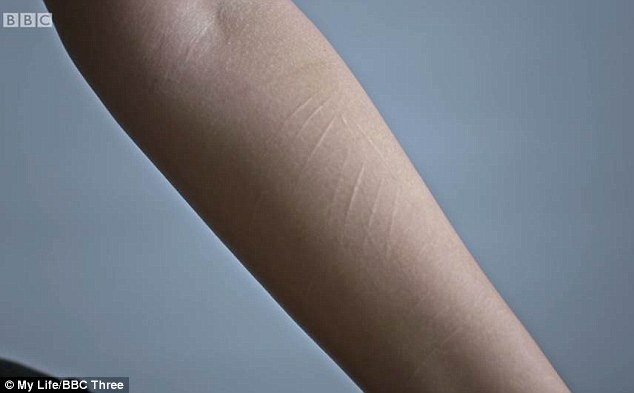 ‘At 11 years old, after about four months of self-harming, my P.E. teacher pulled me aside after a lesson and said “I saw the cuts on your arm, you need to see a school counsellor”. ‘For me personally I was always worried about being a disappointment to my mum. I did have regular thoughts about suicide during my whole depression. I had a few times where I tried to overdose. 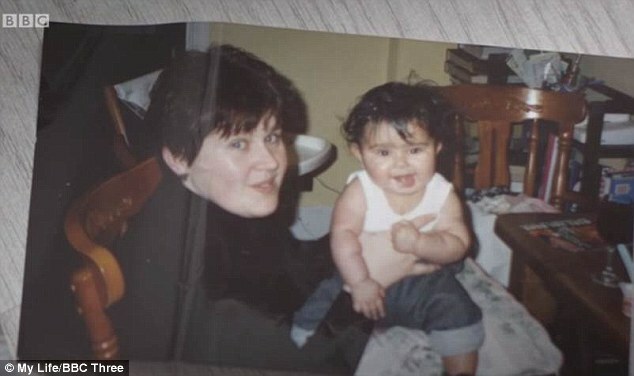 Viktoria said that eventually seeing how much her self-harming hurt her mother was motivation to stop. The teenager has decided to become a doctor but is nervous about making her patients uncomfortable because of her visible scars, but says the tattoo will make her less self-conscious. 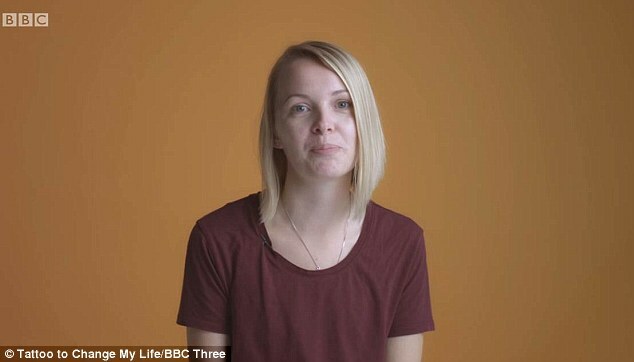 She was diagnosed with depression when at 18 and saw food as her comfort, eating junk food or ready meals and very little fruit or vegetables. 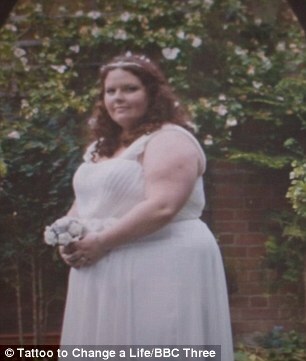 Jen, who has since lost ten stone, stepped back in to the size 28 wedding dress she wore when she got married two years previously. ‘I didn’t like myself, I didn’t like my body or the way it looked, or my life. I got bigger I started using food as a way to control my emotions,’ she recalled. 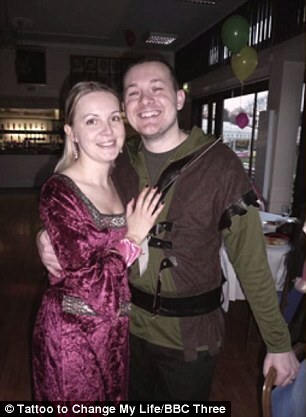 ‘It’s very difficult not to feel that lingering feeling that I damaged my body and have been left with scars all over my body,’ Jen said of her stretch marks which she sees as ‘self-harm scars’. ‘Every time I look at them I remind myself of what I used to do with food,’ she said. Jen chose to have a leaf print design to cover up the marks which appear on the back of her calves as a way to start thinking positively about her future and the progress she’s made.